The Pacific Northwest is known for many things - its beer, its music, its mythical large-footed creatures. Most people don't associate it with earthquakes, but they should. It's home to the Cascadia megathrust fault that runs 600 miles from Northern California up to Vancouver Island in Canada, spanning several major metropolitan areas including Seattle and Portland, Oregon. This geologic fault has been relatively quiet in recent memory. There haven't been many widely felt quakes along the Cascadia megathrust, certainly nothing that would rival a catastrophic event like the 1989 Loma Prieta earthquake along the active San Andreas in California. That doesn't mean it will stay quiet, though. Scientists know it has the potential for large earthquakes - as big as magnitude 9. Geophysicists have known for over a decade that not all portions of the Cascadia megathrust fault behave the same. The northern and southern sections are much more seismically active than the central section - with frequent small earthquakes and ground deformations that residents don't often notice. But why do these variations exist and what gives rise to them? Our research tries to answer these questions by constructing images of what's happening deep within the Earth, more than 100 kilometers below the fault. We've identified regions that are rising up beneath these active sections which we think are leading to the observable differences along the Cascadia fault. The Cascadia subduction zone is a region where two tectonic plates are colliding. The Juan de Fuca, a small oceanic plate, is being driven under the North American plate, atop which the continental U.S. sits. Subduction systems - where one tectonic plate slides over another - are capable of producing the world's largest known earthquakes. A prime example is the 2011 Tohoku earthquake that rocked Japan. Cascadia is seismically very quiet compared to other subduction zones - but it's not completely inactive. Research indicates the fault ruptured in a magnitude 9.0 event in 1700. That's roughly 30 times more powerful than the largest predicted San Andreas earthquake. Researchers suggest that we are within the roughly 300- to 500-year window during which another large Cascadia event may occur. Many smaller undamaging and unfelt events take place in northern and southern Cascadia every year. However, in central Cascadia, underlying most of Oregon, there is very little seismicity. Why would the same fault behave differently in different regions? Over the last decade, scientists have made several additional observations that highlight variations along the fault. One has to do with plate locking, which tells us where stress is accumulating along the fault. If the tectonic plates are locked - that is, really stuck together and unable to move past each other - stress builds. Eventually that stress can be released rapidly as an earthquake, with the magnitude depending on how large the patch of fault that ruptures is. Geologists have recently been able to deploy hundreds of GPS monitors across Cascadia to record the subtle ground deformations that result from the plates' inability to slide past each other. Just like historic seismicity, plate locking is more common in the northern and southern parts of Cascadia. 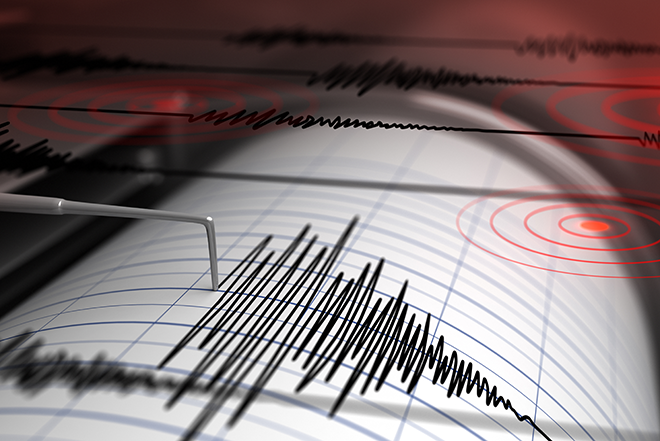 Geologists are also now able to observe difficult-to-detect seismic rumblings known as tremor. These events occur over the time span of several minutes up to weeks, taking much longer than a typical earthquake. They don't cause large ground motions even though they can release significant amounts of energy. Researchers have only discovered these signals in the last 15 years, but permanent seismic stations have helped build a robust catalog of events. Tremor, too, seems to be more concentrated along the northern and southern parts of the fault. What would cause this situation, with the area beneath Oregon relatively less active by all these measures? To explain we had to look deep, over 100 kilometers below the surface, into the Earth's mantle. Physicians use electromagnetic waves to "see" internal structures like bones without needing to open up a human patient to view them directly. Geologists image the Earth in much the same way. Instead of X-rays, we use seismic energy radiating out from distant magnitude 6.0-plus earthquakes to help us "see" features we physically just can't get to. This energy travels like sound waves through the structures of the Earth. When rock is hotter or partially molten by even a tiny amount, seismic waves slow down. By measuring the arrival times of seismic waves, we create 3D images showing how fast or slow the seismic waves travel through specific parts of the Earth. To see these signals, we need records from seismic monitoring stations. More sensors provide better resolution and a clearer image - but gathering more data can be problematic when half the area you're interested in is underwater. To address this challenge, we were part of a team of scientists that deployed hundreds of seismometers on the ocean floor off the western U.S. over the span of four years, starting in 2011. This experiment, the Cascadia Initiative, was the first ever to cover an entire tectonic plate with instruments at a spacing of roughly 50 kilometers. What we found are two anomalous regions beneath the fault where seismic waves travel slower than expected. These anomalies are large, about 150 kilometers in diameter, and show up beneath the northern and southern sections of the fault. Remember, that's where researchers have already observed increased activity: the seismicity, locking, and tremor. Interestingly, the anomalies are not present beneath the central part of the fault, under Oregon, where we see a decrease in activity. So what exactly are these anomalies? The tectonic plates float on the Earth's rocky mantle layer. Where the mantle is slowly rising over millions of years, the rock decompresses. Since it's at such high temperatures, nearly 1500 degrees Celsius at 100 km depth, it can melt ever so slightly. These physical changes cause the anomalous regions to be more buoyant - melted hot rock is less dense than solid cooler rock. It's this buoyancy that we believe is affecting how the fault above behaves. The hot, partially molten region pushes upwards on what's above, similar to how a helium balloon might rise up against a sheet draped over it. We believe this increases the forces between the two plates, causing them to be more strongly coupled and thus more fully locked. Our results provide new insights into how this subduction zone, and possibly others, behaves over geologic time frames of millions of years. Unfortunately our results can't predict when the next large Cascadia megathrust earthquake will occur. This will require more research and dense active monitoring of the subduction zone, both onshore and offshore, using seismic and GPS-like stations to capture short-term phenomena. Our work does suggest that a large event is more likely to start in either the northern or southern sections of the fault, where the plates are more fully locked, and gives a possible reason for why that may be the case. It remains important for the public and policymakers to stay informed about the potential risk involved in cohabiting with a subduction zone fault and to support programs such as Earthquake Early Warning that seek to expand our monitoring capabilities and mitigate loss in the event of a large rupture.